ProVue Devlopment’s high performance RAM-based database program Panorama has been updated to version 6.0, bringing performance boosts, a new Live Preview feature, and enhancements to ensure that your data stays safe. The final release caps months of preview releases and beta testing. Chief among the improvements in version 6.0 is that Panorma is now running fully native on Intel processors, reportedly upping its speed fivefold; the software is also now fully compatible with Snow Leopard. (It also still runs on PowerPC systems with Mac OS X 10.4 or 10.5). Major new features include Live Preview, which shows users results as they enter criteria; Total Recall, which keeps track of all your information as you enter it and restores it after a crash; and Time Lapse, which stores snapshots of database versions over time, so you can roll back to a previous version if necessary. 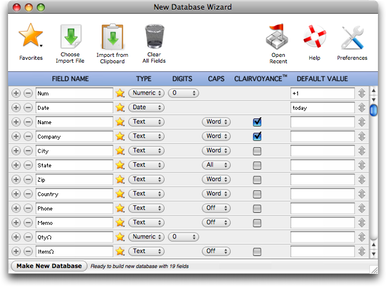 In addition, Panorama 6 includes a friendlier, more customizable data sheet; a new search dialog box that not only lets you any or all database fields, but also accommodates Boolean formulas and stored searches. There’s also a new graphical user interface for Panorama’s data manipulation tools that provide live previews and savable transformation rules, completely redesigned import and export wizards, and improved programming tools—including 57 new statements and functions. Panorama 6 requires Mac OS X 10.4, 10.5, or 10.6 and is compatible with existing databases from Panorma 3, 4, 5, or 5.5. A Windows version runs on XP, Vista, and Windows 7. A full version for either Mac or Windows runs $299, whereas upgrades range from $140 to $250. Updated at 1:35PT with a screenshot that better reflects Panorama 6's interface.